A couple of years ago, not long after starting Cakeyboi, I made Posh Top Hats. I realised pretty soon after posting this that I had jumped the gun a wee bit. I made a more grown up version of this little treat that I grew up with, thinking that everyone knew what Top Hats were! How wrong could I have been? Well, it seems like these are not internationally known, but more a local delicacy. Top Hats are very, very easy to make and perfect for a kids birthday party, or take to a bake sale. All you have to do is melt chocolate and that’s as technical as it gets. Petit four cases are lined with a little of the melted chocolate then a marshmallow is sunk into the chocolate. A little dollop of molten choc on top then a smartie added to that and that’s it! 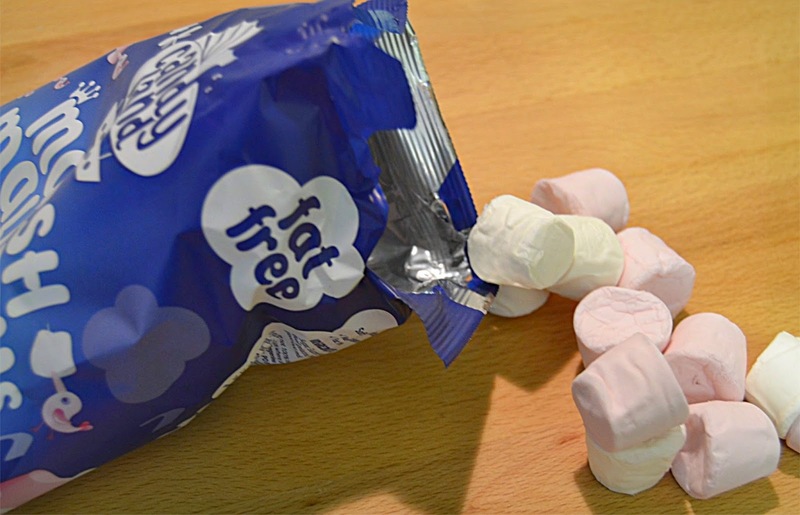 There was always a brand of marshmallow you HAD to use for these, nothing else would be right. They were Princess marshmallows. They came in pink and white and were the perfect shape for Top Hats. I went looking for these when I was going to make them, but could I find them? I did find ones named Candyland marshmallows, and it turned out these are the same. I’m not sure if they’ve rebranded Princess ones. Anyhoo, as for the chocolate, the cheaper the better is what is called for here if you want truly authentic Top Hats. A baking chocolate called Scotbloc was always used and I don’t think it had been near a cocoa bean in it’s life. I couldn’t get that so supermarket own brand cooking (milk) chocolate was a good substitute. But it melted well and set quickly so was the go to ‘chocolate’ for the job. And real Smarties had to be used. None of those milk chocolate beans nonsense. 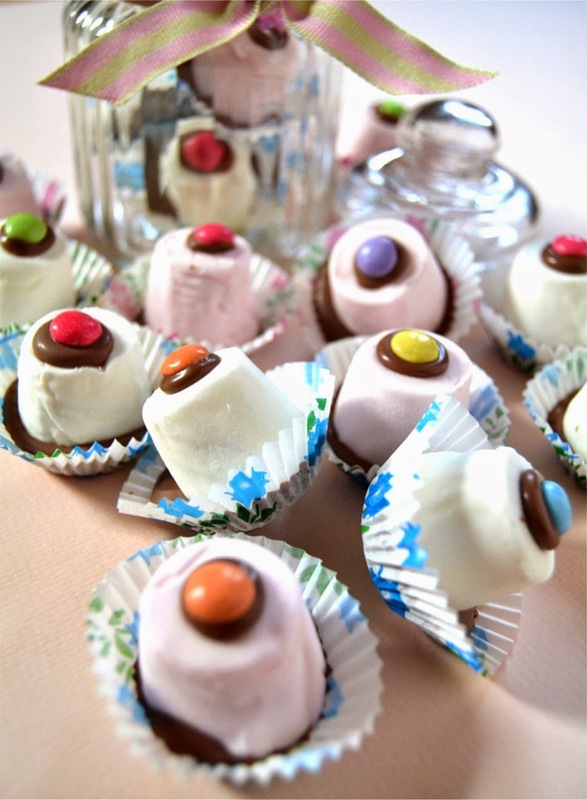 I bought a bag of Smarties to make these and realised they were mini-Smarties, but they look cute I thought! Melt the ‘chocolate’ in a microwave or over a pan of boiling water (microwaves were scarce when I was young). Spoon chocolate into the bottom of each case and place the mallow into the chocolate. Lastly a drop of chocolate on top and add the Smartie. That’s it. Just let the chocolate set and they can be set out for whatever function you are catering! Kids and adults gobble these up, so make lots. And if you do want to go that little bit further – check out my Posh Top Hats. Three colours of homemade marshmallow and dark chocolate are used for these. And I went the whole hog and used a peanut M&M on top. These weren’t exactly the same, but were fun to whip up. As these are from my childhood, I am submitting them into Treat Petite this month as I came up with the theme Childhood Memories. I am hosting and Kat at the Baking Explorer will be next month. And I am submitting these into Laura’s Biscuit Barrel challenge at I'd Much Rather Bake Than – the theme this month is Summer. My birthday is slap bang in the middle of summer, so Top Hats remind me of that time. And this month’s We Should Cocoa is going gluten-free and these fit the bill perfectly! Michelle at Utterly Scrummy is hosting this month. These are very cute! I love reading all about childhood foodie traditions. One of my favourite traditions, as bizarre as it sounds, is hitting each other in the forehead with chocolate marshmallow tea cakes! Maybe it was a welsh thing! I don't have siblings so wasn't exposed to that Kate - what a waste of a tea cake lol! They are pretty dangerous things Laura! And you are Scottish - I am surprised! Good to know they made it across the Irish Sea! How fun! I know Izzy would love to make these. I've never heard of them at all but I think they'll be making an appearance in our kitchen soon. I'd never heard of these either. What we missed in England! For us it was all cheese and pineapple hedgehogs and jelly and ice-cream. Cheese and pineapple hedgehogs - surely not at a kids party? They could have impaled themselves on the cocktail sticks!! How funny, I am teaching a kids cookery class this weekend and they asked to make marshmallow pops. I think I will be making these with them too. What kid would not like chocolate, marshmallow and Smarties together?! I would love them for myself and they look so pretty! These are super cute and definitely great for a party. I've never heard of them before so this is my something new for today :) Love the posh top hats too but I prefer these - nice and simple. How adorable. 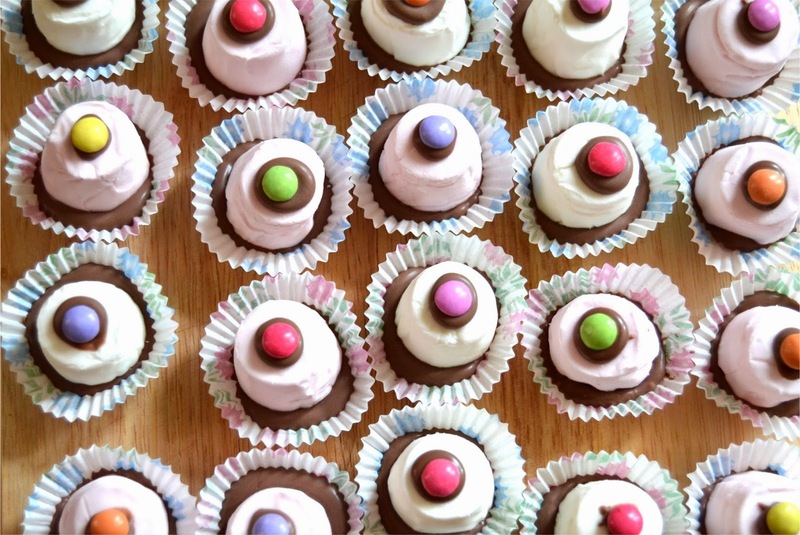 These look like such a perfect treat for parties and great for kids to make themselves! These are stunningly pretty, so eye catching! Glad you like them Sarah, I'm still experimenting with the new camera! Yum! Great photos too Stuart - I can definitely see all those tips you learnt at the blogging conference being put to great use!! Yes, forgetting them already Gem lol!! I make something really similar to this for my daughter's birthday parties, but I didn't know they were called 'top hats'.They are particularly moreish though. The kids get very few by the time I have nibbled my way through a load when making them! Intrigued to know what you make that is similar Kate - spill!! Never heard of top hats before, but I rather suspect if they were anywhere in my vicinity, I would be gobbling more of them than I should. 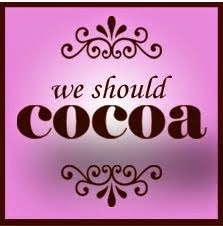 Just as well they are not common down this part of the country ;-) Thanks for entering them into We Should Cocoa. I've not heard of these before but they look perfect for a children's party and so simple to make! I know this post is old but it really put a smile on my face. :) My partner didn't know what they were and didn't really get it when I explained them to him... It was great to show him a photo! This was after I discovered Princess marshmallows for sale in my local Tesco (Oxford) and said I'd have to make him 'top hats'. I also thought they were well known! I'm from Edinburgh so maybe it's a Scottish thing? Can't wait to make them again!